Holiday Parties, Trade Show Attractions, Team Building, Award Banquets, Company Picnics and PA and Projector Rentals we can help! We can customize a package to meet any needs. If you simply need a DJ or if you are looking for a full scale production we can help. Through our industry connections we can help you do anything from a murder mystery dinner to a simple party. We have performed at a wide range of corporate events for a wide range of companies. Our well spoken MC's will represent you perfectly in front of any corporate crowd. We can also provide PA system rentals, video projectors and screens. 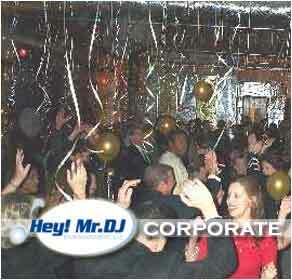 Contact us to find out how we can benefit your next corporate function. NEW! Online Song Requests! Your employees can request songs for your event on our website!